Saturday brought on a new beginning for two programs — one at the forefront of national conversation, the other placed on the back burner. One has a high-profile coach, and the other’s coach has his dream job. One has an elite defense, and the other has the best wide receiver group in the country. Both have one thing in common: Ole Miss quarterbacks. Shea Patterson was a blue-chip prospect coming out of high school and headlined the 2016 Ole Miss recruiting class. Tabbed as the No. 1 dual-threat quarterback, Patterson was perfect to set the college football landscape ablaze under Hugh Freeze’s offense. After Chad Kelly suffered a season-ending injury, the Patterson era began more quickly than expected. Leading a second-half comeback on the road against Texas A&M, Patterson gave the Rebel faithful a glimpse of greatness. Sadly, he would never reach the levels of Archie, Eli or Chad. Within the first seven games of the season, the Rebels suffered four losses — three of which were blowouts — and lost Patterson to a knee injury that cost him the rest of the season. Ole Miss’ first half against LSU would be the last time Patterson took the field as a Rebel. Patterson joined a group of players, including high-profile recruits Deontay Anderson and Breon Dixon, that left Ole Miss in a mass exodus as a result of the NCAA investigation and subsequent sanctions. His decision led to an interesting meeting at the Oxford IHOP with Michigan head coach Jim Harbaugh. Harbaugh was in search of a competent quarterback, and Patterson was in search of a way out. They were a perfect match. The unlikely union between the two led to hyperbolic proclamations across the country. Matt Hayes of Bleacher Report wrote an article titled “QB Shea Patterson Ready to Be Michigan’s Savior After Escaping Ole Miss Wreckage.” There are two things to dissect here. First, Michigan’s recent result against Notre Dame proves that the work of a “savior” is not as easy as writing words on paper. When he left Ole Miss, Patterson left behind an experienced offensive line with four returning starters as well as a wide receiver corps as deep and talented as any in the country. 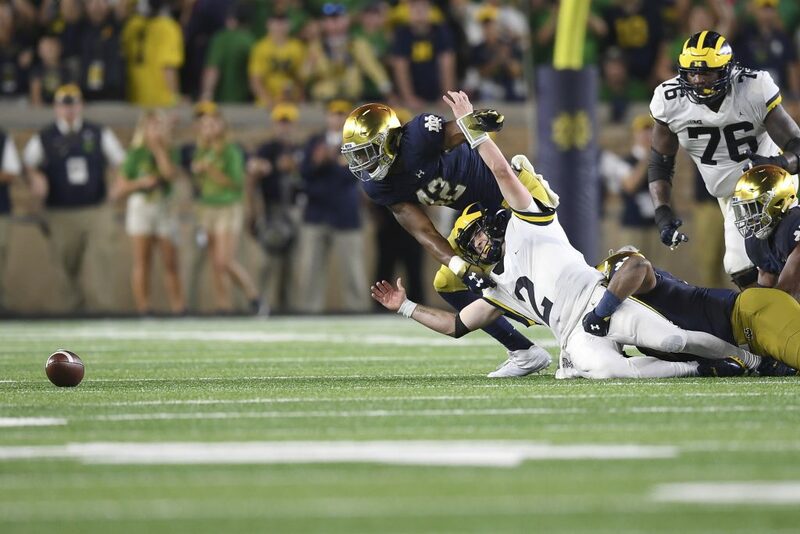 In his first game this season, Patterson had to operate without one of his top receivers — Tarik Black, who injured his foot in practice — as well as without an offensive line capable of keeping the Fighting Irish’s front seven out of the Michigan backfield. Constant hits and humidity led to Patterson suffering cramps throughout the second half. The play-calling from Harbaugh was clearly not built for the skillset of a player like Patterson, who spent most of the game under center. Coach and quarterback are not clicking yet. On Saturday, Western Michigan will offer the duo another chance to build some offensive momentum that Michigan desperately needs as it nears a three-week stretch of matchups versus top-15 opponents. And, of course, Michigan’s high profile rivalry game versus Ohio State at the end of the regular season looms, as Ohio State is looking as good as ever. If Patterson cannot lead the Wolverines to victories in these matchups, the savior may join the long list of Harbaugh’s underwhelming Michigan quarterbacks. On the other side of the divorce are Matt Luke and the Rebels. Ole Miss is in the second season of its two-year bowl ban. There is little to no pressure on Luke except to build the program for when the time comes again for Ole Miss to play for bowl berth. Ole Miss’ current roster puts the team in a perfect situation, moving past the 2018-19 season. The “Nasty Wide Outs” can scare any defense they face, and Scottie Phillips has already established himself as a playmaker at running back. The Rebels’ real star is the man who filled in full-time following Patterson’s injury and took in stride all the hardships and responsibilities an SEC quarterback faces. This man, Jordan Ta’amu, was a no-name junior college transfer from New Mexico Military Institute who chose a backup role with the Rebels over a chance to start for Minnesota. Nobody expected that the player waiting in the wings was ready to explode. Ta’amu burst onto the scene by leading the Rebels to three wins, among which was a statement win in the Egg Bowl, that brought the Rebels’ season to a .500 record. The Rebels’ offense has stabilized considerably since Ta’amu — whose fit in Phil Longo’s system seems more natural than Patterson’s was — began starting at quarterback regularly.